I've recently reviewed the first book in the series, The Fifth Season, here and was delighted to hear that it has garnered the 2016 Hugo Award for best novel. While I haven't read the rest, it blew me away and is certainly my favorite read of the year so far. 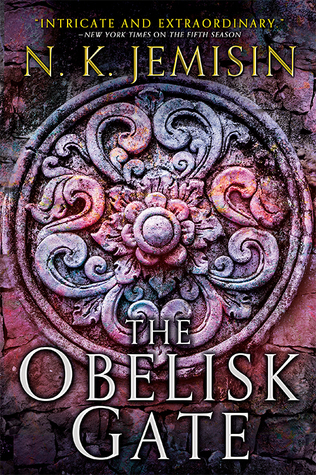 So will The Obelisk Gate be able to live up to the very high bar Jemisin set with The Fifth Season? The season of endings grows darker as civilization fades into the long cold night. Alabaster Tenring -- madman, world-crusher, savior -- has returned with a mission: to train his successor, Essun, and thus seal the fate of the Stillness forever. It continues with a lost daughter, found by the enemy. It continues with the obelisks, and an ancient mystery converging on answers at last. The Stillness is the wall which stands against the flow of tradition, the spark of hope long buried under the thickening ashfall. And it will not be broken. The first recommendation I'd make is DON'T pick up this one if you haven't already had the pleasure of reading The Fifth Season, what with the continuation of the unusual POV -- in second person 'you' for one of the main protagonists, the slightly fractured nature of the narrative time and the density and richness of this odd, dystopian world, I think it would be an almighty struggle to work out what was happening. The Obelisk Gate pretty much takes up the story where The Fifth Season finishes and Jemisin doesn't hold up the action to explain the story so far... So if it was a while ago you read the first book, then I'd have a quick skim just to remind yourself of exactly what was going on, just so you can fully appreciate this extraordinary story. I was slightly concerned that the unfolding story might slide into a more predictable pattern, or the intensity of The Fifth Season might slump. Nope. I was immediately whisked back into this desperate situation, bonding with these spiky, difficult characters. They are people I'd rather never encounter in my daily life -- all carrying emotional baggage and scrabbling to survive, they are lethal. However, I found them all engrossing, such that several times I read with a lump in my throat and on one occasion had to blink back the tears -- not something that happens all that often to me, these days. Any grizzles? Nassun is only ten years old and during the first part of the book, I never forgot that fact, but as she is steadily pulled further into the middle of the action, I don't think she continues to realistically act like a ten-year-old. Even an amazingly talented, traumatized child surrounded by people she knows want to harm her... That said, it isn't a deal-breaker and if I didn't spend a chunk of my normal life around that age-group, I probably wouldn't have even registered it as an issue.